Get ready for the ultimate Star Trek adventure! TOS Communicator Replica includes sound effects and clips. Features a pop-open design and deluxe window-box packaging. "Two to beam up." 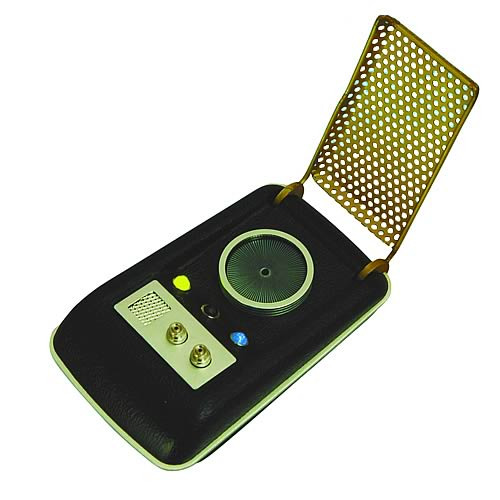 Get ready for the ultimate Star Trek adventure with this TOS Communicator Replica! With sound effects and clips from the groundbreaking Star Trek: The Original Series, the Communicator features a pop-open design and deluxe window-box packaging. The Communicator measures about 4-inches tall x 2 1/2-inches wide when closed. Don't be caught on your next away mission without one of these handy lifesavers. Beam it up now! The Communicator requires 3x "AAA" batteries, which come included.